Over 150,000 Readers: Our newspapers offer more news and information than you can find anywhere else. We offer more news about the communities we cover than any other newspapers in the world. Guaranteed Distribution: Our newspapers are audited by one of the nations largest newspaper auditing firms, Circulation Verification Council (CVC). You don’t have to take our word for it; we have the proof to back up our claims. Local Community News: Our professional editorial staff combs the community for hyper-local news and features including business briefs, opinions, calendar of events, dining and theater reviews, area sports and much, much more making our content appealing to people of all age groups and personal interests. All of our news and advertisements are accessible and updated daily. Proven Results: Just ask any of our advertisers and they will tell you how pleased they are with the exposure they receive in our newspapers. We have a proven formula with a professional format and aesthetically pleasing, clean, easy-to-read design. Award-Winning: We are proud of the numerous national awards we have won including the coveted ‘general excellence award from IFPA, the second largest free newspaper association in the country. 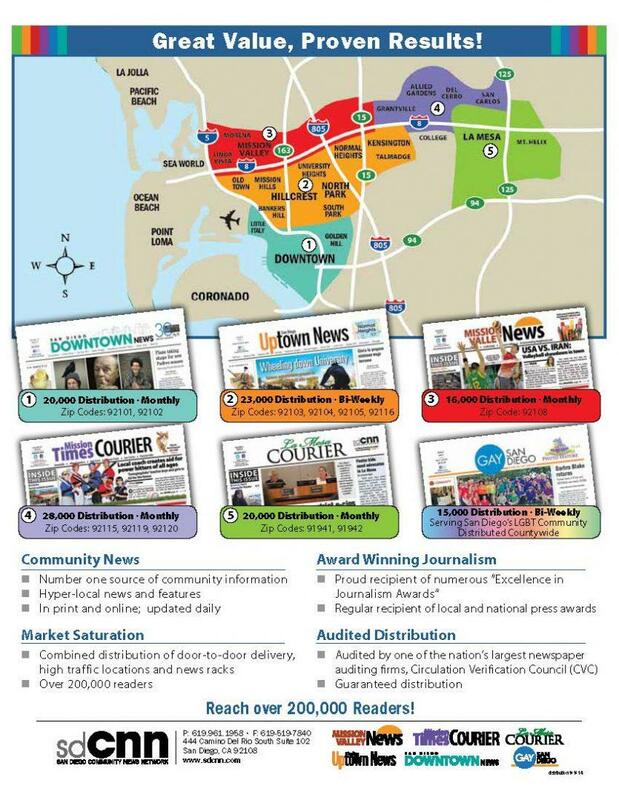 We hope you enjoy our newspaper and should you want more information on how we can help you market your business, please contact Mike Rosensteel at (619) 519-7775 x 108 or e-mail him by clicking here. I would love to nominate and share with the community a wonderful interior designer named, Suzi O’Brien with EcoLux Interiors. Suzi is a well-seasoned professional who specializes in eco-friendly lifestyle and eco-friendly interior design services. She also specializes in relocation services and aging-in-place design. Suzi is exceptional and her services cover all over San Diego. I would love to put you in contact with her and help promote her business a little more! Please let me know how I can help! Hi Melissa, if you are interested in advertising please contact our Sales and Marketing Director Mike Rosensteel at 619-961-1958 or mike@sdcnn.com. Thanks!